Precipitation starts 2-4 PM, mostly as rain in our area, then mixes with sleet and snow. A mix of sleet, rain and snow falls for much of the storm. Temperatures at the surface are shown as above freezing by most of the statistical models. QPF values have increased to over 1.10 inches water. (NAM) Temperatures at the surface remain above freezing according to the statistical models. The average temperatures in the lower atmosphere are at or below freezing. Ordinarily, this would be a slam dunk major snowfall, BUT temperatures in the upper atmosphere become too warm to support snow during the heaviest QPF. The short range models continue with a mix of sleet, rain and snow. The changeover to all snow late in the storm occurs after the heaviest has past. Philadelphia, south NJ (east of the Delaware) will have minimal accumulation. Immediate suburbs north and west about 2-3 inches of heavy mixed snow and sleet, increasing to 7-10 inches in the far north and west. The further north and west, the more accumulation. This is a tough forecast. 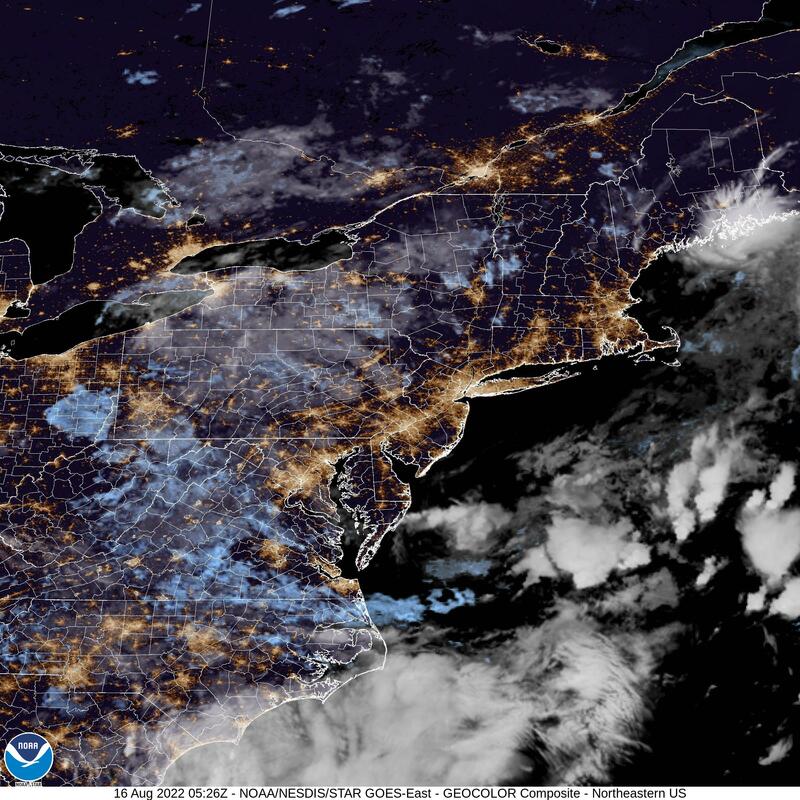 My regular readers of this blog know that predicting accumulation from these storms can sometimes be a choice of upper atmosphere temperatures versus lower temperatures. Despite the snow-supportive temps in the lower atmosphere, I think the “high 500mb thickness” representative of a warm upper atmosphere will cause more rain and sleet to fall than snow in Philadelphia and immediate suburbs. I went down this wrong path in November. This storm will be a good test of the same forecast issue. It would be easier to predict a large snowstorm for Philadelphia and the immediate suburbs but I’m not going with that at this time. A quick update based on current short range (HRRR, RAP, NBM-H ) models. The short range models are emphatic that the thermal profiles are not supportive of all-snow in much of the immediate Philadelphia area. Precipitation starts about 4 PM, mostly as rain in our area, then mixes with sleet and snow. A mix of sleet, rain and snow falls for much of the storm. Temperatures at the surface are shown as above freezing by most of the statistical models. QPF values remain in the 0.6- 0.9 inches of water range. This mix of precip doesn’t lend itself to the usual 2-4 inch description. My feeling is that the warm thermal profiles aloft will significantly reduce the snow totals in the areas shown in green above. The mix will change back to all snow before ending about daybreak Monday, but much of the remaining QPF will be low. After the precipitation ends about 6-7 AM Saturday morning, skies will be mostly cloudy with brightening skies and possibly some sun during the mid to late afternoon. High 40-42. Latest models are showing snow for late Sunday. For Sunday, increasing clouds. Snow begins in the mid afternoon and ends Monday morning. Current trends is for snow for Philadelphia and north and west. Accumulations 3-5 inches, based on current QPF. The early NAM data has become available. QPF values are 0.39 inches water. Precipitation is just moving into the Philadelphia area now. There are some changes– temperatures at critical levels in the atmosphere appear to remain too warm for snow in Philadelphia and the immediate suburban areas for much of this precipitation. Areas far north and west (Doylestown and north and Pottstown and west) will have rain/sleet changing to snow about 2-3 AM. A few hours of snow are possible before ending between 6 and 7 AM. 2 or so inches possible. 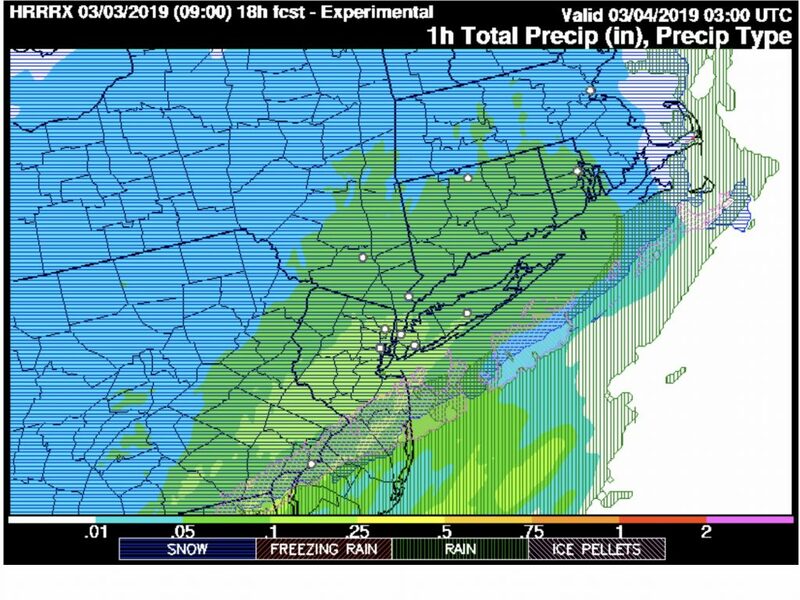 For the immediate suburbs of Philadelphia- mostly rain or rain with some sleet….cold air does move in aloft towards the end the storm and there may be a transition to snow with some light accumulation before ending between 6 and 7 AM. Nothing significant, as it’s March and anything that falls will melt soon enough tomorrow. As we can see, the forecast can change for these borderline thermal profile events. I’ll be checking the GFS later this evening when it becomes available. There’s still uncertainty with the Sunday storm. Stay tuned. A very difficult forecast for tonight. Yet another wave of low pressure will move along the stalled boundary to our south. The GFS and NAM have similar QPF values, the NAM having a greater QPF (as almost always) than the GFS. The approximate QPF is 0.35 inches water. The GFS is warmer at the surface and colder at critical levels. The NAM is colder at the surface and borderline warm for snow at the onset. Both models have similar onset of precipitation – 9 -10 PM tonight and both have the precip ending by 7 – 8 AM Saturday. I’m going to lean towards the NAM with a rain/sleet/snow mix at the onset, changing slowly to all snow overnight. At times the precip will mix back to sleet and rain. Areas to the north of the white areas in the video will be all snow. 2-4 inches possible in far northwest. Closer to the city, 1-2 soggy inches, mostly grassy surfaces. This forecast is as good as I can do it. BTW, the Sunday evening storm is still too much in flux to call. The GFS is warmer and the NAM is colder. It’s likely mostly rain, but that forecast can change. I’ll focus on this over the weekend. I’ll be updating this forecast tonight, probably with the NAM early data around 9:15 PM.